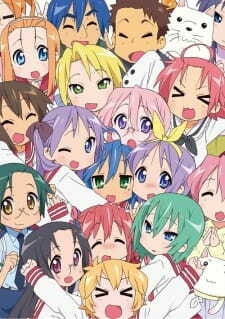 Lucky Star is a slice of life comedy parody anime that references to many well known anime as a back story. It has some funny moments as well as some random moments that everyone will enjoy. Lucky Star is basically a arc-less anime with comedic slice of life style thrown upon it. There is really no story to it except the daily lives of the character. The "story" basically can be translated as "a group of high school students trying to make it through high school". If you are in it for the story then this probably won't suit your needs. On the other hand, if you are in it for the laughs then this will satisfy. The art is decent as expected. The characters are pretty much all chibi versions. The scenes were pretty average compared to other popular anime such as K-On! and Special A. You can say that this anime is more of a "manga" style anime than more "realistic". The characters all have unnatural hair colour (purple, blue etc...) but this is probably part of the 'parody' element of the anime's intended portrayal. Sound was audible. There was little soundtracks or background music to enjoy. Of course the theme songs were decent enough to be annoyingly catchy. But I did not find any music to be that memorable throughout the series. The voice acting was pretty good I would say. I could instantly recognise some famous voice actors from other animes instantly. The voices of the characters really showed the character's sense of personality and attitude. The characters were all memorable. I could recognise some references to other anime from the look of the cast. From the top of my head, anime such as The Melancholy of Haruhi Suzumiya and Clannad were well represented from the anime. There is much to love from Konata's personality as well as the hot-headed Kagami. You will find the characters worth liking gradually from the start. Overall, I only ennjoyed the anime for the laughs and to kill time. I really enjoyed the references the other anime which brings out the unique style of this anime. My advise is that if you must watch most of the popular anime before you watch this one, or else you probably miss a lot of laughs and get confused (which happened to me most of the time). On the other hand, if you are an avid anime fan then this will probably give you many laughs. There isn't one. Just 'a group of girls going through high school whilst engaging in comedic dialogue' pretty much sums up this anime series. Don't watch if you want a story. Not the best but not the worst. Average can be said for this anime. You will probably focus more on the characters instead of the background. Some scenes are pretty well drawn out, but overall it could have done a bit better. Sound? What sound? The sound you probably hear the most is either Konata talking or the theme songs. Overall, there is little music to be enjoyed here. The character's voice acting were great though. The cast was well suited for each other. Different personalities were really brought out for each and every character. You will probably notice the chibi style right before you watch. This is how the anime is meant to be presented. Funny moments are plenty...if you get it that is. The lack of a story really did put me off a bit. It is best to watch this anime if you have spare time or nothing else to do. Unless, you are an avid fan of the manga or just want some stupid laughs then this is recommended for you. Could be better is many ways, but what it is right now will only make you want to watch it once. The laughs are plenty here as long as you get what the characters are saying. I also recommend you watch as much anime as you can before you start watching this one or else will be not get it at all. That said, I didn't watch that much before so I sometimes got lost or bored.